Although pretty much every stylist I have ever had has had something bad to say about Pantene products I am beginning to think that they just dont get my hair or something. first of all, whatever is bad about Pantene, I have never seen, second of all, its cheaper than the stuff the stylists are always going to recommend so Im all about it. This particular shampoo really does seem to recognizeably make my hair stronger all the way from the root to the tip. This is hard to do with my hair because it usually easily breaks off and many times right in my hand. 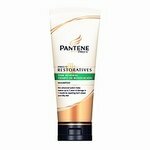 Once I used this product however, the breakage became less and less. Seems to actuallyt work. Less breakage and stronger hair. It doesnt smell as good as i would like it too and Im picky about how my shampoo smells. This advanced multi-Pro-Vitamin system repairs up to 2 years of damage from highlights, blow-drying and more and it helps every strand mirror healthy, shiny, renewed hair. Multi-pro-vitamin formula gently cleanses and contains special detanglers that help prevent friction while smoothing the uplifted cuticles during the rinse phase, to leave strands smooth. The Pro-V Time Renewal Shampoo and Conditioner system can restore up to 2 years of damage by repairing the damage from the root and the outer layer of hair.